Why do I call this the Perfect Parve Party Cake? First, it is parve so it can be served after a traditional Jewish Sabbath or holiday meat meal. Secondly, it is very easy and quick to prepare. 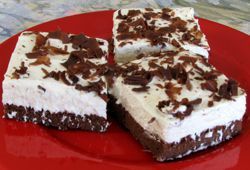 Thirdly, it is aesthetic and delicious with its chocolate base and creamy topping. Note that since it is flourless, it can even be served during Passover. For those who don't eat soy products during Passover, use a non-soy milk substitute to keep the cake parve. Using regular milk instead of soy milk works, but remember that this will make the cake dairy. Preheat oven to 350 Fahrenheit (180 Celsius). Separate eggs. Set yolks aside. Whip whites until stiff, but not dry. Add sugar to egg whites. In the microwave, melt the bittersweet chocolate with 6 tablespoons water. Mix yolks into melted chocolate. Bake for 20 minutes at 350 Fahrenheit (180 Celsius). Remove from oven and let cool. The cake will deflate as it cools. Whip cream, milk substitute, and pudding together in a mixer. Spread on cooled cake. Using a vegetable peeler to create chocolate flakes. Sprinkle on the cake. TIP: Cake must be completely cool before spreading the whipped topping on it.